Kansas center Bailey Helgren (35), right, blocks a shot in the Jayhawks' home game against Oklahoma State at Allen Fieldhouse on Wednesday. The timing of Kylee Kopatich’s 3-pointer couldn’t have been any better. Hoping to end a 12-game losing streak, Kansas found itself tied with No. 25 Oklahoma State with under three minutes to play at Allen Fieldhouse. A spark on defense helped the Jayhawks hold the Cowgirls scoreless for the final two minutes and 38 seconds of the game. But KU still needed a go-ahead score to end its winless drought. Kopatich was the one who delivered just that. The sharp-shooting guard from Olathe nailed a 3 from the top of the key to seal the 66-59 win. It was the first made field goal by KU (12-15, 3-13 in Big 12) since the nine-minute mark in the fourth quarter, but Kopatich said her team’s belief in securing a win never wavered. KU finished the game on a 7-0 run after Austin Richardson and Christalah Lyons nailed a pair of free throws. 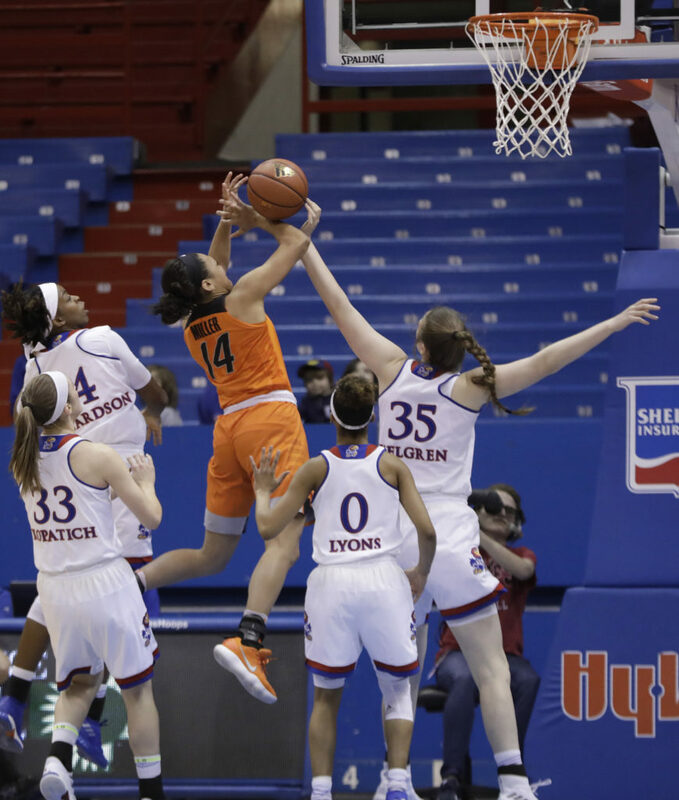 But before the Jayhawks were even in position to win, they had to overcome the one-two punch of Oklahoma State guard Loryn Goodwin and center Kaylee Jensen, who the Jayhawks struggled to contain in the first half. Goodwin got off to a quick start on offense for Oklahoma State after scoring 11 points in the first quarter. And Jensen, standing at 6-foot-4, established her size early and often against KU’s frontcourt. She added six points and five rebounds in the opening period. The Cowgirls (18-9, 9-7 in Big 12) did not commit a turnover in the first quarter and took eight more shots than the Jayhawks to build a five-point lead heading into the second quarter. 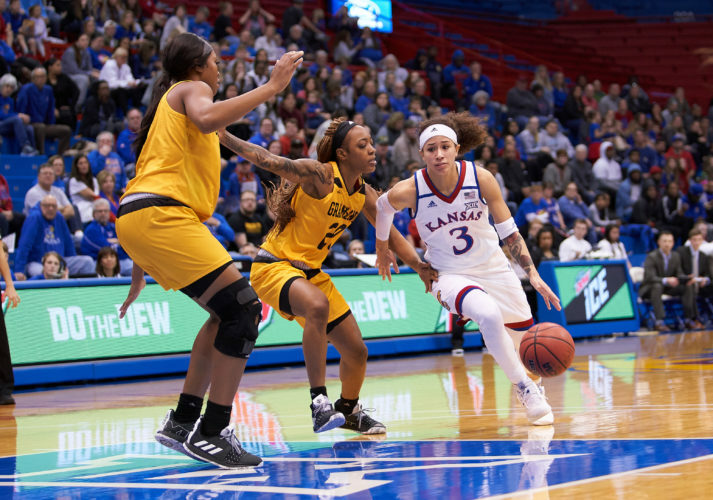 But after falling behind by as many as nine, KU surged back into the game by ending the first half on a 12-2 run to take a one-point lead into halftime. The comeback was spearheaded by KU center Tyler Johnson (11 points), who scored seven points in the second quarter. KU went on another 12-2 run in the third, where Kopatich began to catch fire. She scored nine points in the third, including two 3s. “We fought really hard to have the momentum (heading into halftime), and we felt like we needed to start the third quarter with the mindset that we’ve got to take back the momentum and continue to fight every possession,” Schneider said. The Jayhawks also limited the production of Goodwin and Jensen in the second half. The duo combined for just 13 in the half after combining to score 26 in the first. Goodwin finished with 21 points, and Jensen recorded 18 points and 11 rebounds. The 6-foot-2 Johnson said it was key for her team to make a defensive adjustment and limit the paint production of Jensen, who came into the game averaging 18.6 points and a conference best-10.5 rebounds. KU will next travel to Manhattan to play K-State on Saturday. Tipoff is scheduled for 3 p.m.